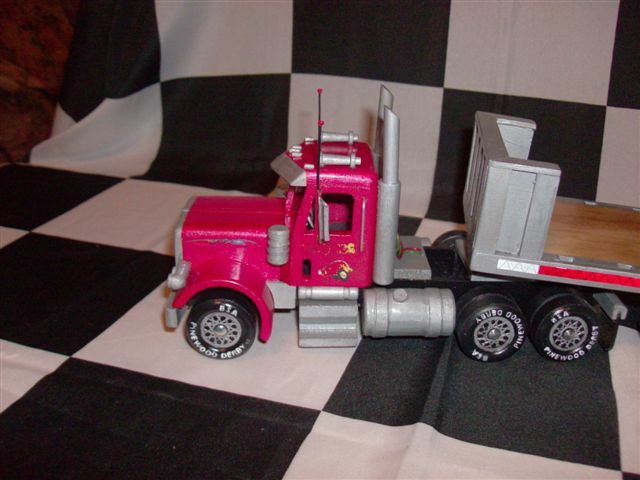 In years past, BSA offered a unique kit, “The Big Rig – 18 Wheeler”. 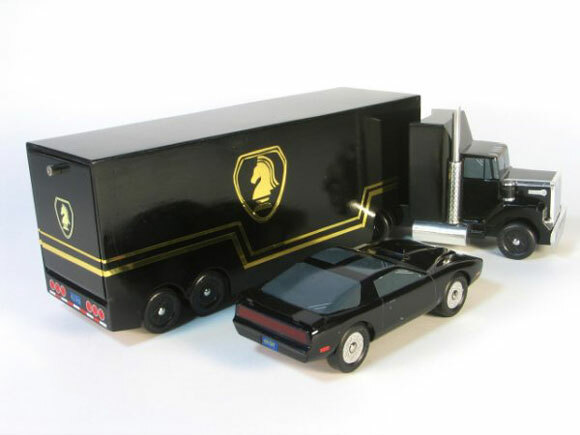 Basically, it was a pinewood-derby style semi-truck and trailer. Although they are no longer offered by BSA, occasionally one will show up on eBay. Being curious, I acquired a kit and decided to put one together. Immediately upon opening the box, I realized that this would not be a simple pinewood derby car build. The part count is considerably higher than a pinewood derby car kit, and the kit includes my two least favorite types of wood, balsa and hardboard. Let’s begin. First we will need several small clamps and some wood glue. Then glue the trailer together piece by piece, allowing the glue to dry on each part before proceeding. One important point is to make sure that each piece is perpendicular to each other. I used a spare pinewood derby block as a guide to keep the sides square. Next, we’ll move to the cab. The balsa cab is glued to the base, and then the fenders and roof are shaped and attached. This is where I ran into the first hiccup. The templates in the instructions don’t really match the photo on the box, nor do they fit well on the cab. So I had to do a little jigsaw puzzle work to make them look right. You can sort of see this in the photo below. After attaching the fenders, the body is complete and ready for sanding. I mentioned earlier that I don’t like to work with balsa or hardboard. Balsa is very porous, so it must be sealed before painting. Hardboard just doesn’t sand well. To seal the balsa, I coated the entire cab with a thin layer of wood filler, and fixed some dings on the trailer with Bondo. After priming, I made further touch-ups with Bondo. Next, I painted the entire assembly blue. Note that the cab and trailer are separate units. I just set them together for the photos. The paint is not perfect; I think the paint was a bit old and the temperature was really too high for painting (I think we hit 110 during the few days that I was painting — but I painted in the morning when it was only 90!). Now it was time to add the details. I used the dowel rods for the fuel tanks (painted silver), but decided to use aluminum tubing for the exhaust pipes. These parts were attached with epoxy. The windows were created with black window material. I had some wide yellow pin striping which was used for the side stripe. The letters were problematic until I found out that there are several on-line sign shops that offer custom lettering. I went with www.customonlinesigns.com. Although you can get exactly what you want, it isn’t cheap. For two sets of lettering in my font, style and color, the shipped cost was $30.71. Finally, the wheels and axles were attached and the swivel pin was inserted (to attach the trailer to the cab). I then declared the project complete. I certainly could have done more detail work such as lights, front grill, etc. — maybe another time. To get an idea of the type of detail that can be added, here is a Big Rig created by Mark Robison. If you really enjoy modeling projects, then give this project a try. Just make sure you have the shelf space to displace your Big Rig. 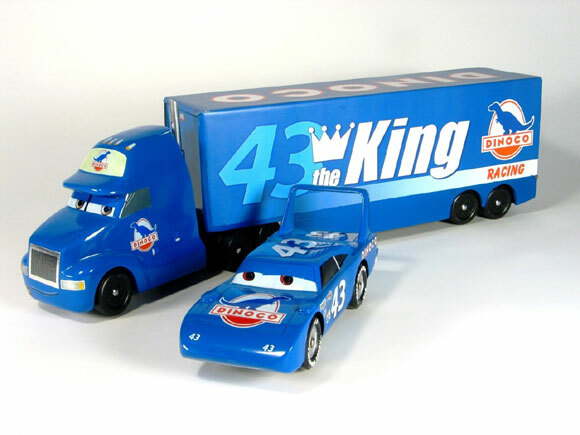 Due to the length of the Big Rig kit, the vehicle cannot be directly staged on most tracks. So, an extension must be added at the starting line. In addition, the vehicle may be too high to fit under the finish line. So, you may need to manually judge a Big Rig race. Some additional Big Rigs from Andy and Noah Holzer. This was my last year of Cub Scouts so I decided to build one of my favorite cars for my last Pinewood Derby. KITT was from an old television show called Knight Rider, the car is an ’82 Firebird, Trans Am. My dad found a website that sells a scanner (the light in the front of the car). It was for a larger scale car but we made it work with my pinewood derby car. I had to learn to solder to get all of the small wires connected to the circuit board. KITT came in second place in the Webelo II race, it also got an award for Coolest Looking Car. My dad worked to get a Big Rig race this year so we built two Big Rigs for the race. We made mine look like the FLAG Mobile Unit 01, the semi that fixed KITT on the television show. 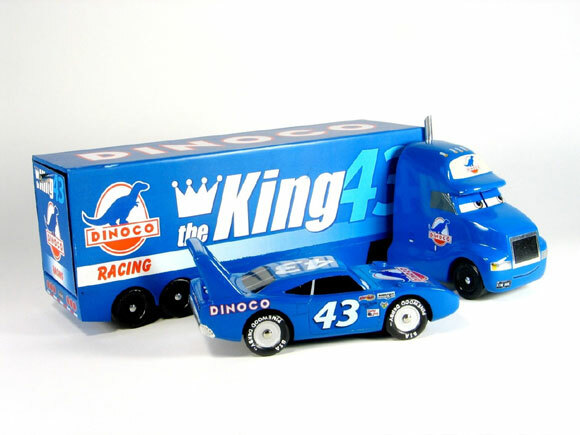 I knew what my first Big Rig would be, the King Hauler. 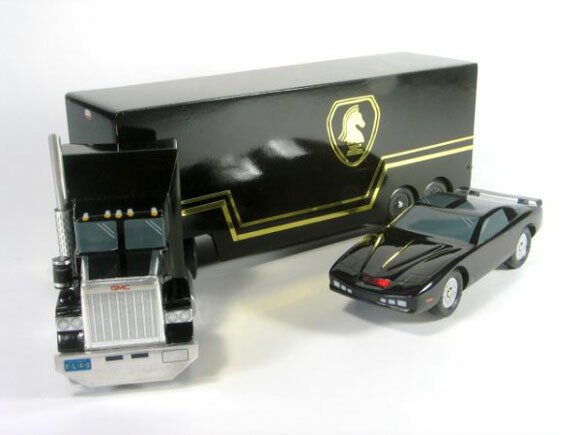 I had never built a Big Rig, but the first time I saw one I thought they were very cool. So when BSA released their version for the 100th Anniversary of Scouting I needed to get one to build. The only trouble with the BSA kit is that one of the cardboard boxes that the kit comes in is also used for the trailer box; that would just not do. I built a box that could actually house The King. It turns out that all of the five entries in this year’s Big Rig Race had built their own trailers out of wood. Building a Big Rig is not much different than building a car (a lot more wheels and axles to prepare), but the weight seems to sneak up quicker (our max weight is 25 ounces). In any case, I would highly encourage your group to have a Big Rig race. Our Royal Ranger district just approved the use of the BSA kit — in addition to its own kit — for the first time. Some of the commanders think that the BSA kit is faster. Other than the precise alignment of the axle rod, I think it makes no difference in race performance. Is there any evidence that one car type is better or faster than another? The RR kit has a longer wheelbase. This tends to produce a faster car mainly because you can locate the COG further back on the car. If you are allowed to change the wheelbase on the BSA kit, then the difference is negated. The RR kit has narrower, but heavier wheels than the BSA kit. The BSA wheels are also more accurately made. So, I believe that the BSA wheels would be faster than the RR wheels. However, if you can use weight reduced wheels, then you might be able to make the RR wheel faster than the BSA wheel. 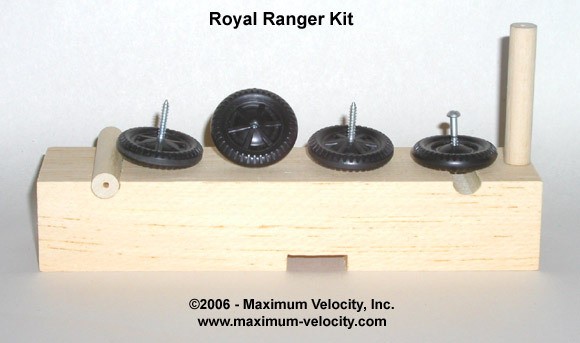 The RR kit wheels have a 1/8 inch (.125) bore, while the BSA wheel bore is about .096. So, on each wheel revolution, there is less plastic contact on a BSA wheel/axle. 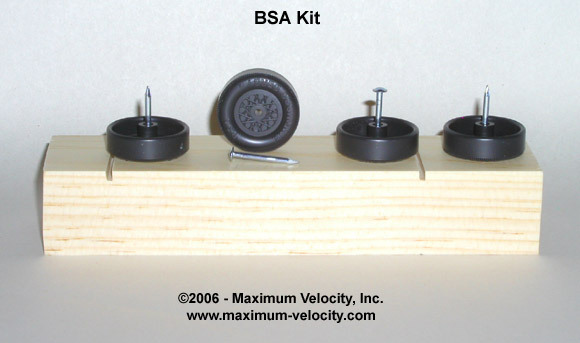 However, the RR wheel is 1.25 in diameter while the BSA wheel is 1.185. So the RR wheel will rotate fewer times on its trip down the track. The BSA kit uses axles slots. It can be a challenge to get the axles in straight, but there are tools (Pro-Body Tool and Pro-Axle Guide) available to simplify this task. The RR kit has dowel rods that must be glued to the body in an accurate way. Also, the pilot holes for the screw axles are not generally centered on the dowel rod. So, these holes must be re-drilled (Royal Ranger Pro-Body Tool). So, there are several factors to trade off. But, I would tend to go with the BSA kit, as it would eliminate the issues with the dowel rods. Can you tell me where to find information on how to set up the races so that each boy races against each other. I know that at one time someone in our pack found a program that let you put in all of that information, but they are gone now. There is a nice software package called Grand Prix Race Manager which will do this for you. It does a lot more as well. The basis of chart generation is a technique called Partial Perfect-N. This method gives the best distribution of heats when a perfect chart cannot be generated (which is a Perfect-N chart, but Perfect-N charts only exist for a few cases). One of the pack members bought an axle polishing kit that does not have fine sandpaper (like your Axle Polishing Kit which we have) but instead has 800 grit paper and pumice. Will Pumice work better than your finest paper (2500 grit)? Pumice is generally about 1500 grit, so I would use our axle polishing kit and skip the pumice.